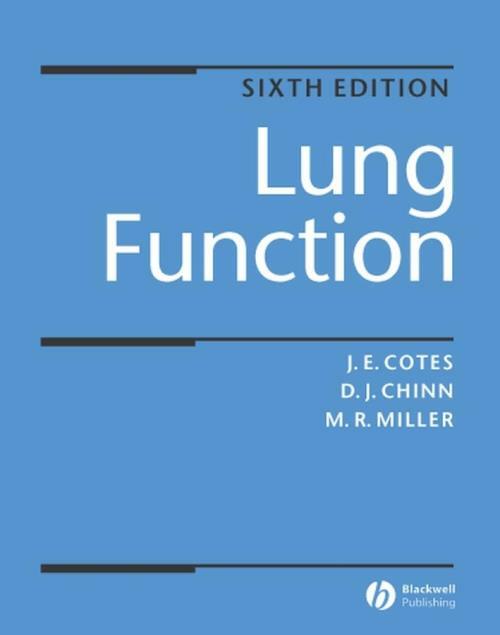 "I have always considered Dr Cotes′ book the most authoritative book published on lung function. It is also the most comprehensive." "I think I can fairly speak on behalf of staff in lung function departments the length and breadth of the country – that a sixth edition of Cotes would be gratefully received." 1. Early Developments and Future Prospects. 3. Development and Functional Anatomy of the Respiratory System. 4. Body Size and Anthropometric Measurements. 5. Numerical Interpretation of Physiological Variables. 6. Basic Terminology and Gas Laws. 7. Basic Equipment and Measurement Techniques. Part 2. Physiology and Measurement of Lung Function. 9. Thoracic Cage and Respiratory Muscles. 11. Lung and Chest Wall Elasticity. 12. Forced Ventilatory Volumes and Flows (Ventilatory Capacity). 13. Determinants of Maximal Flows (Flow Limitation). 14. Theory and Measurement of Respiratory Resistance (Including Whole Body Plethysmography). 15. Control of Airway Calibre and Assessment of Changes. 17. Distribution and Measurement of Pulmonary Blood Flow. 18. Inter–relations Between Lung Ventilation and Perfusion. 19. Transfer of Gases into Blood in Alveolar Capillaries. 20. Transfer Factor (Diffusing Capacity) for Carbon Monoxide and Nitric Oxide. 21. The Oxygenation of Blood. 22. Gas Exchange for Carbon Dioxide and Acid–Base Balance. 24. Newborn Babies, Infants and Young Children (Ages 0 6 years). Part 3. Normal Variation in Lung Function. 25. Normal Lung Function from Childhood to Old Age. 26. Reference Values for Lung Function in White (Caucasian) Children and Adults. 27. Genetic Diversity: Reference Values in non–Caucasians. 28. Physiology of Exercise and Changes Resulting from Lung Disease. 29. Exercise Testing and Interpretation, including Reference Values. 30. Assessment of Exercise Limitation, Disability and Residual Ability. Part 5. Breathing During Sleep. 32. Investigation and Physiology of Breathing During Sleep. 33. Assessment and Treatment of Sleep Related Breathing Disorders. Part 6. Potentially Adverse Environments. 34. Hypobaria: High Altitude and Aviation Physiology and Medicine. 35. Immersion in Water, Hyperbaria and Hyperoxia Including Oxygen Therapy. 36. Cold, Heat and the Lungs. 37. Airborne Respiratory Hazards: Features, Protective Mechanisms and Consequences. Part 7. Lung Function in Clinical Practice. 38. Patterns of Abnormal Function in Lung Disease. 40. Lung Function in Asthma, COPD, Emphysema and Diffuse Lung Fibrosis. 41. How Individual Diseases Affect Lung Function (Compendium). 42. Lung Function in Relation to General Anaesthesia and Artificial Ventilation. 43. Lung Function in Relation to Surgery.